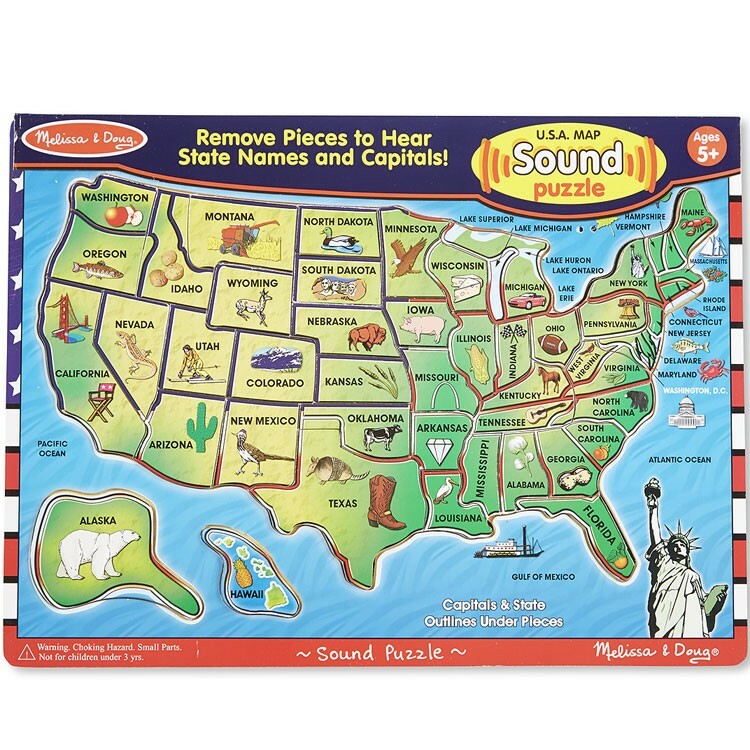 Match the American states with the right spots on the map and learn more geography with this USA Map Sound Puzzle by Melissa & Doug! Match the American states with the right spots on the map and learn more about our country! 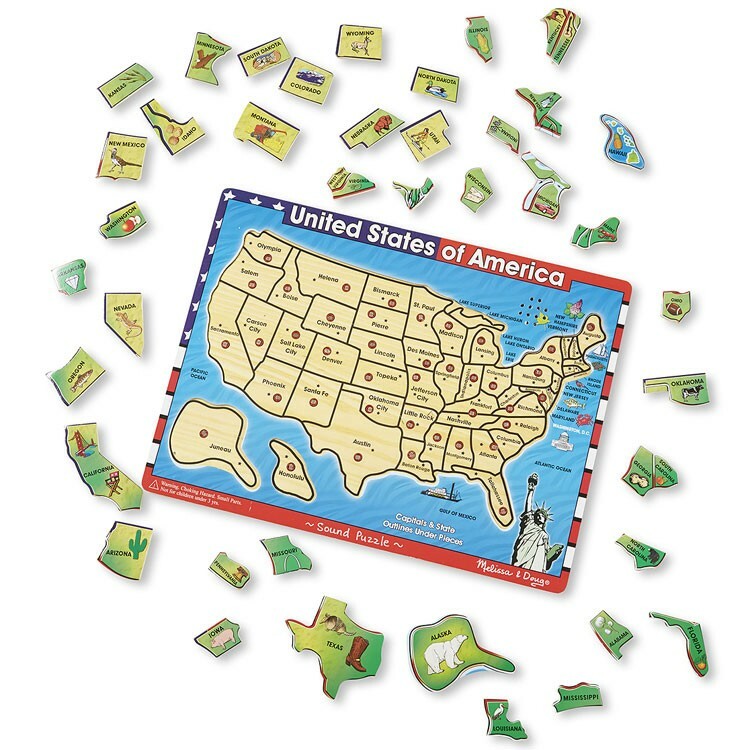 The USA Map Wooden Sound Puzzle by Melissa & Doug is a fun way to learn US geography. 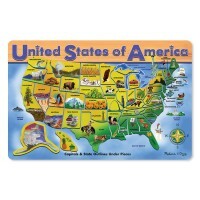 This map wooden puzzle will assist children in memorizing US states and their capitals. 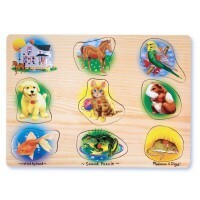 This geography electronic puzzle is made of quality wood and is children-safe hand-painted. 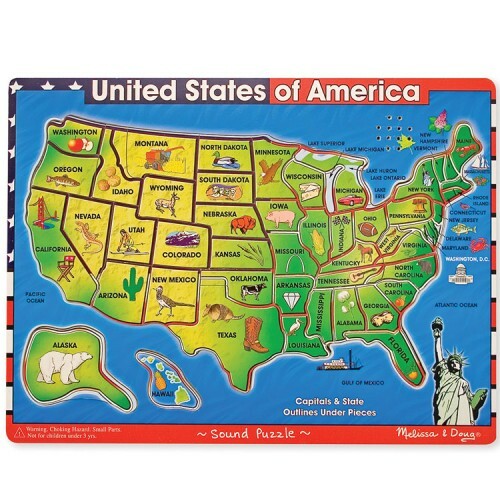 The USA Map Wooden Sound Puzzle from Educational Toys Planet comes with 40 wooden puzzle pieces with all 50 states (some states are put together on the same pieces). 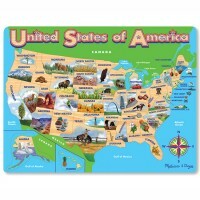 As each state puzzle piece is placed correctly kids will hear the names of the states and capitals! 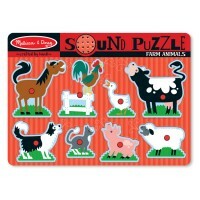 Every state puzzle piece has a picture of state animal, plant, or landmark for children association. 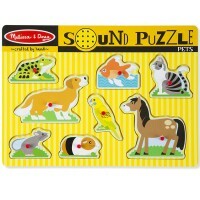 Play with this learning sound puzzle and the US geography will not puzzle you any longer. 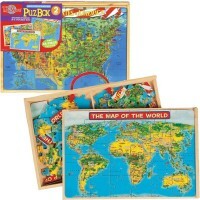 Dimensions of package 9" x 3" x 12"
Write your own review of USA Map Wooden Sound Puzzle. Rating: 4 Very fun by Jessica G This is a great toy for kids who love puzzles but is also great for kids who do not like puzzles as much. The sounds make it more enticing. It can be used by younger kids as well as elementary or even middle school kids learning about U.S. geography. 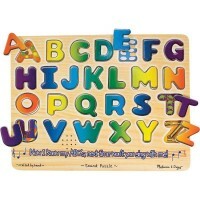 M & D always makes great quality toys so this puzzle will probably last until your great grandkids are ready to play with it. Rating: 5 by Karen, OK i HAVE BEEN LOOKING FOR THIS FOR A WHILE! gLAD TO HAVE IT. Rating: 5 by Allison, OH The puzzle was so great!!!! My God son loved it! I will in the future order more products from your company. 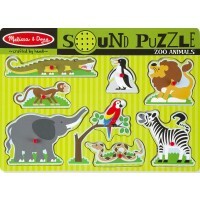 Rating: 5 by Joseph, NY The puzzle has a pretty good sound. Rating: 5 by herman, PA It's good for Alzheimer's! Rating: 5 by Carol, FL Fabulous learning tool. 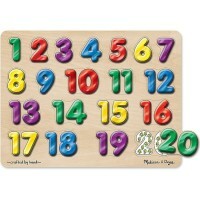 Rating: 5 by Elly, NJ First: my son is not into puzzles, but this is his ABSOLUTE FAVORITE since he was two and a half! 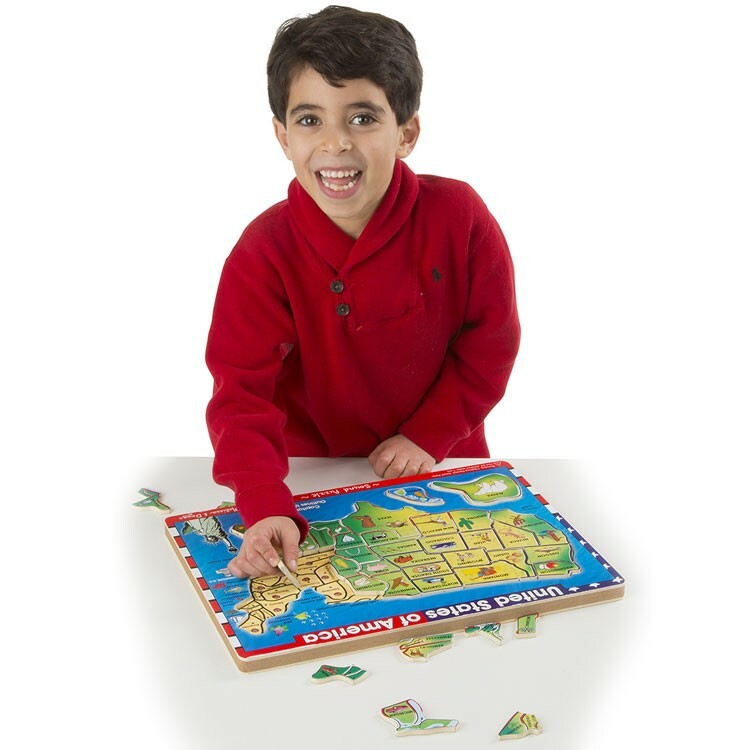 This puzzle has 40 wooden pieces (some small states share a puzzle piece), farely small, yet thick enough for kids to handle them with comfort. The best part is: the puzzle names every state and capital! Every state has a picture, so we like to discuss how much fun it is to ski in Colorado or to eat Lobsters in Main. My son used to bring his building trucks and load the pieces into the puzzle that way. First, he would hand me over the piece, and I (actually a building truck assigned to me) would place it on the board, name it, talk to him about it. Then his own trucks took over the job. Now, at four, he just puts this puzzle together all by himself without any toys AND proudly repeats (or even names) every state as he is placing it on the board! 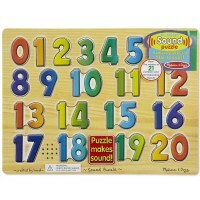 I really like that this puzzle, while challenging even for the older kids, can be adopted for the smaller ones as well.